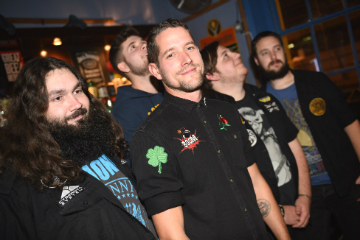 Hastings Fat Tuesday Music Festival - which has played host to up-and-coming bands like Brighton's 40 Shillings on the Drum, as well as named headliners such as Skunk Anansie- has won Event of the Year 2018 at the Celebration of Sussex Life Awards. The fastest growing festival in the South-East, and the UK's largest Mardi Gras celebration, Hastings Fat Tuesday marks its 10th anniversary in 2019. Borrowing heavily from the New Orleans take on Mardi Gras ("Fat Tuesday" is English for Mardi Gras), the festival is also hailed as Hastings' answer to SXSW in Texas. In 2018, Hastings Fat Tuesday made the Telegraph's list of the world's top twelve places to party. Adam Daly, Festival Director, said: "We are honoured and delighted to receive this award, which shows just how far Hastings Fat Tuesday has come. "We are committed to providing platforms to showcase the very best local talent, as well as welcoming emerging and established artists from all over the UK, and there are plenty of treats in store for the landmark 10th edition of Hastings Fat Tuesday." Previous headliners have included Dodgy, The Membranes, and Skunk Anansie. Unplugged Saturday (2 March) - a hugely popular acoustic afternoon in Hastings Old Town, with 200 individual performances. Fat Tuesday Tour (5 March) - the climax of the festival with 24 of the best emerging and established bands touring Hastings Old Town venues, performing three 20-minute sets each. Applications should be made online at apply.hastingsfattuesday.co.uk by the deadline of 1st December 2018. Applicants will be asked to provide a bio, information about recent gigs, and links to their music. Hastings Fat Tuesday Music Festival runs from 1st to 5th March 2019. CLICK HERE for more info.